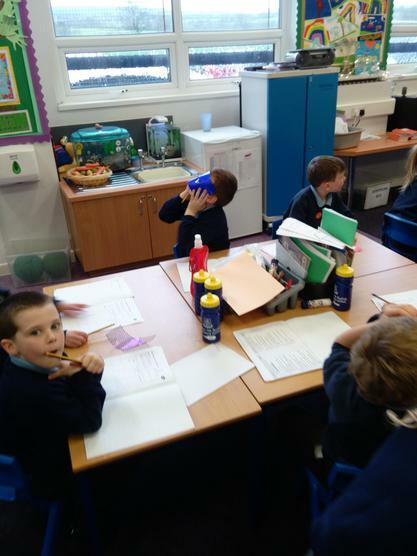 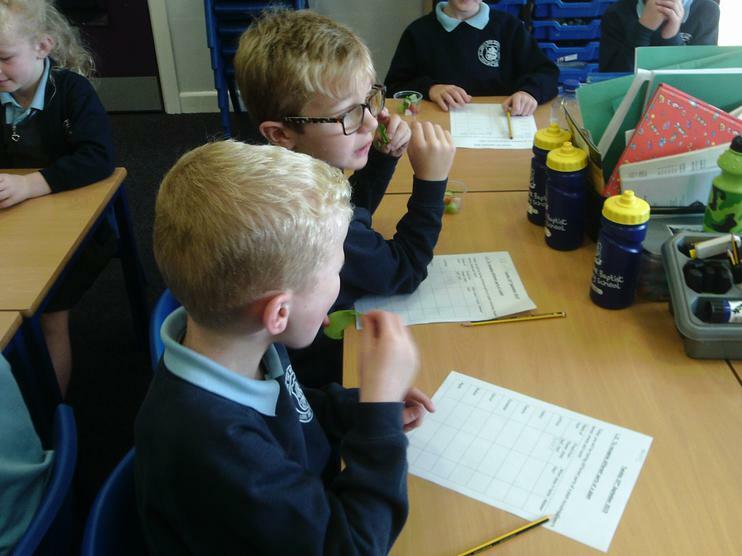 The children looked around the classroom, school and outside to see which kind of materials are used such as brick, glass, plastic, wood etc. 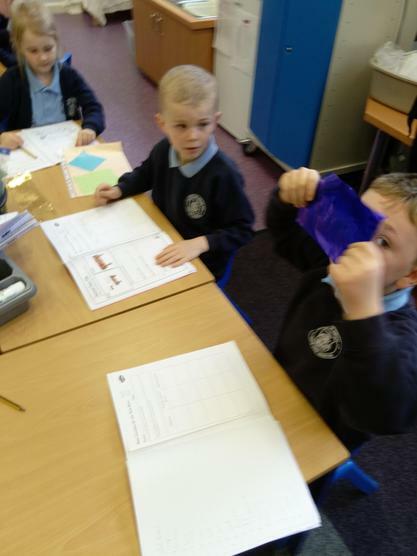 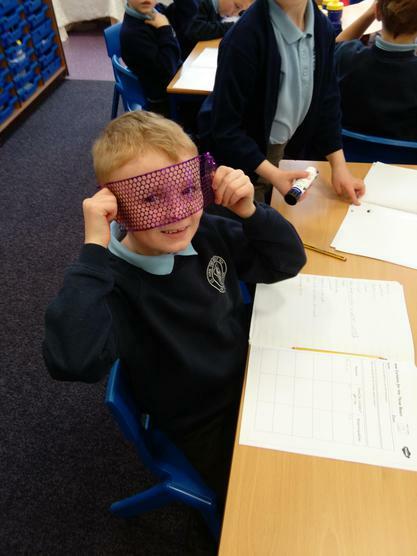 The children had to test 5 different materials to see which would make the best curtains for the 3 Bears bedroom after Goldilocks damaged them! 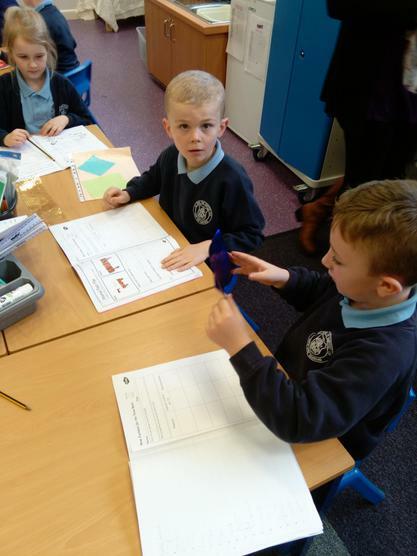 The 3 bears had some qualities that they were looking for in a pair of curtains. 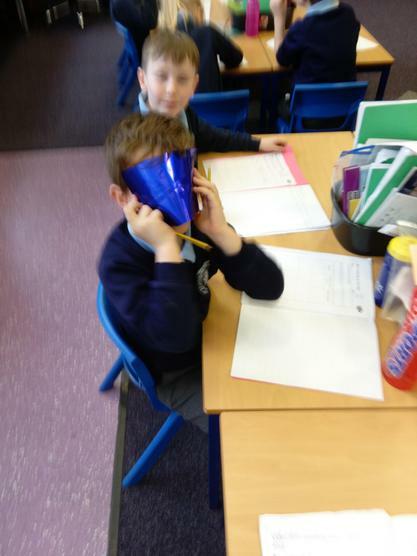 These were: To keep out light, to hang down, to open and close and finally, to look nice in a room. 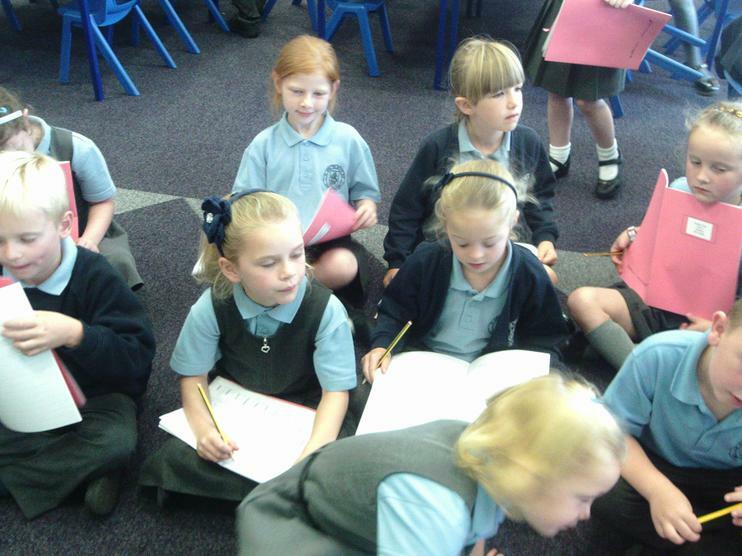 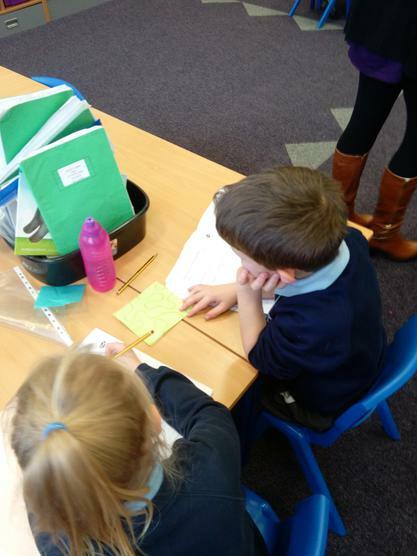 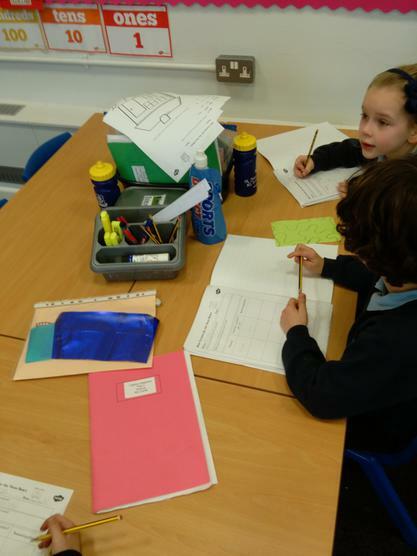 The children worked well as a team as well as using scientific vocabulary to explain their results. 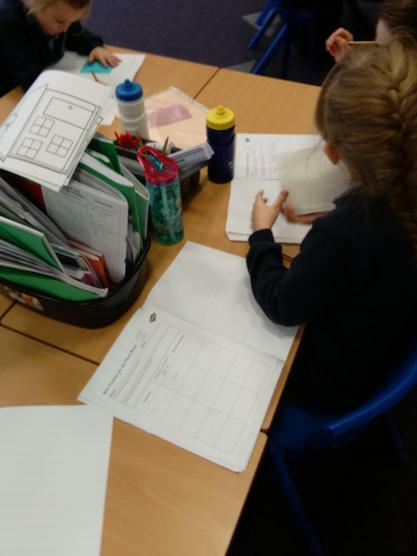 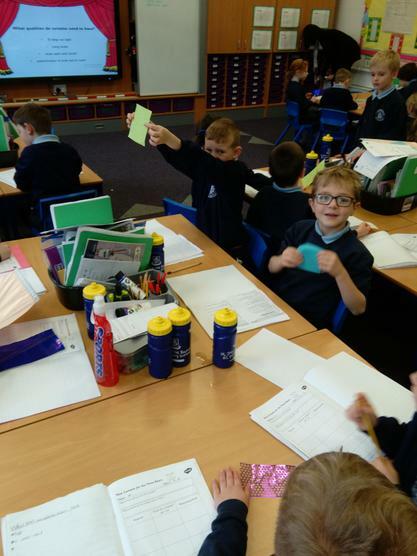 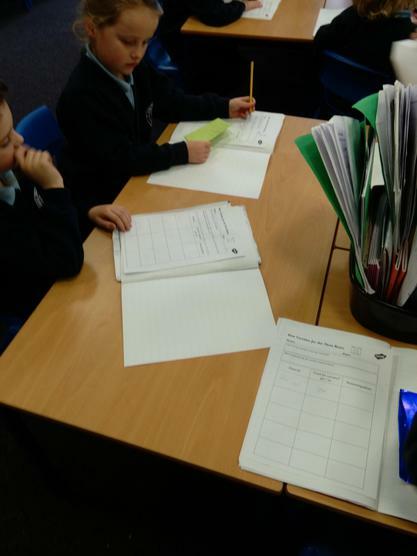 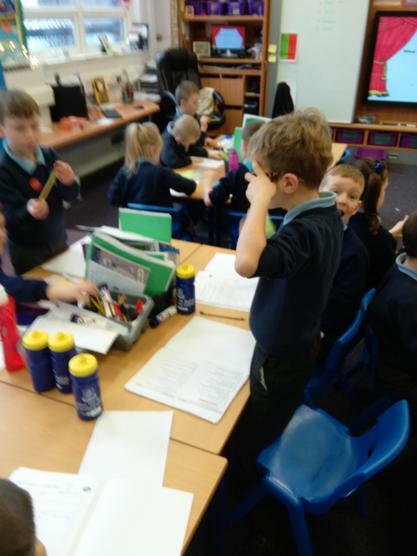 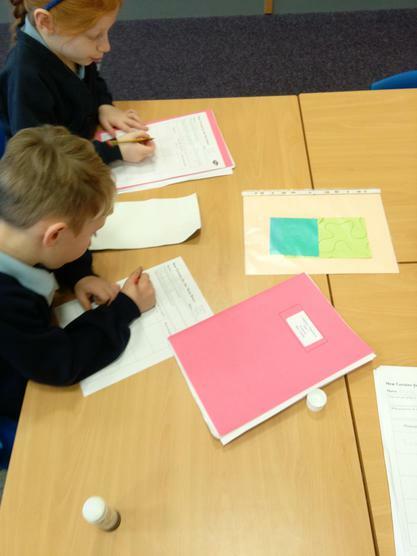 The children then had to discuss in their groups what they had found and then feed back to the whole class on which material would be the best...and why! 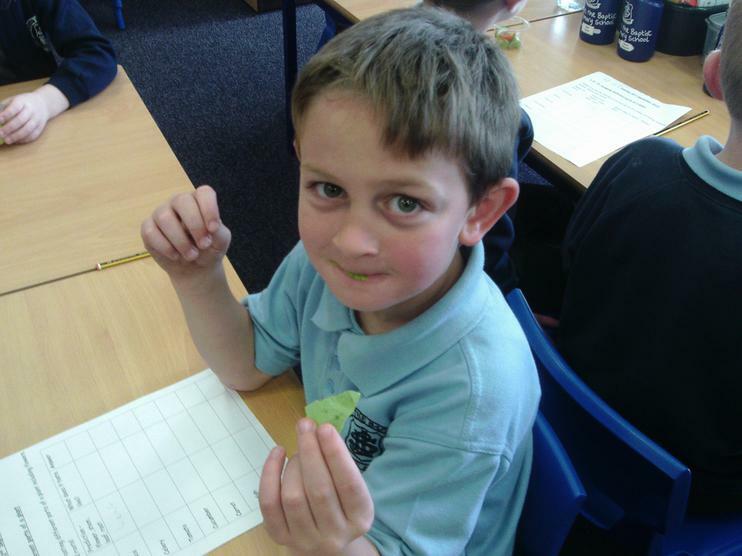 This half-term, our Science topic is PLANTS. 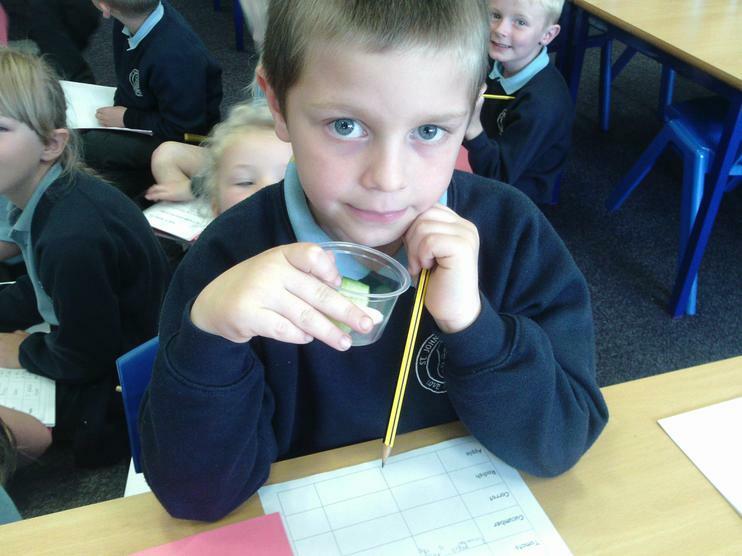 So far, we have grown some cress in different conditions and have all taken a sunflower seed home to record its growth in a weekly diary. 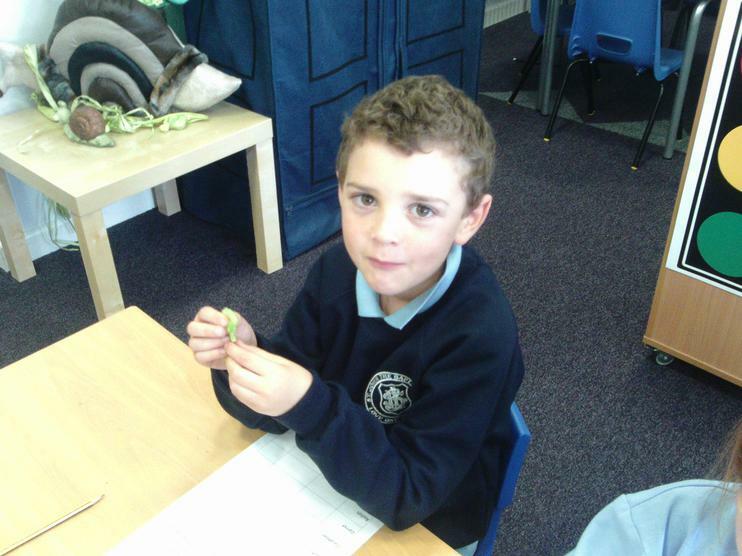 We have looked at germination and how seeds grow into mature plants. 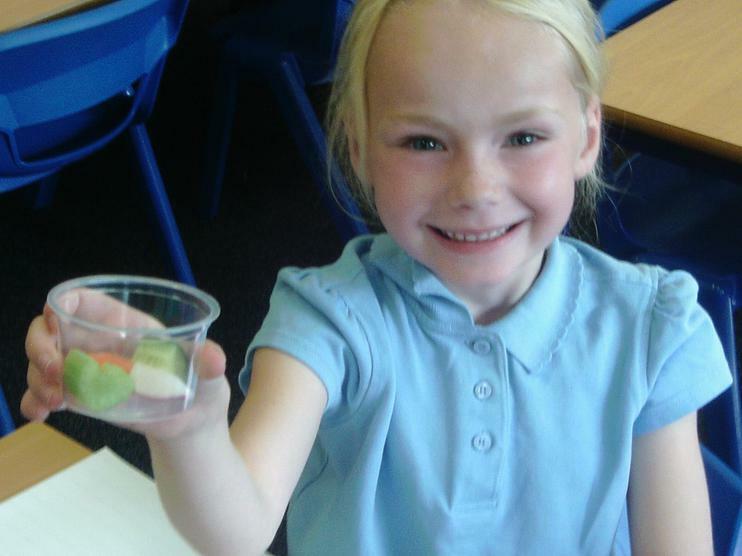 We discovered that to grow into a strong healthy plant, they needed water, sun light and to be a suitable temperature. 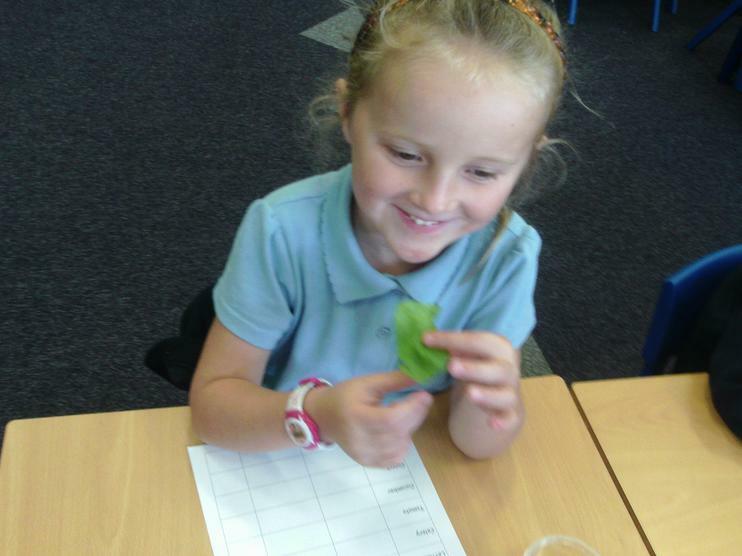 We have also looked at the 4 main different parts of a plant; flower, stem, leaves and root. 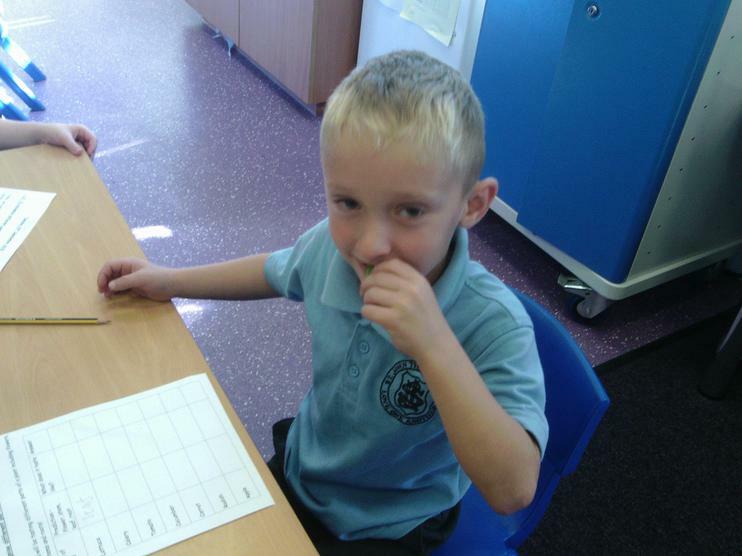 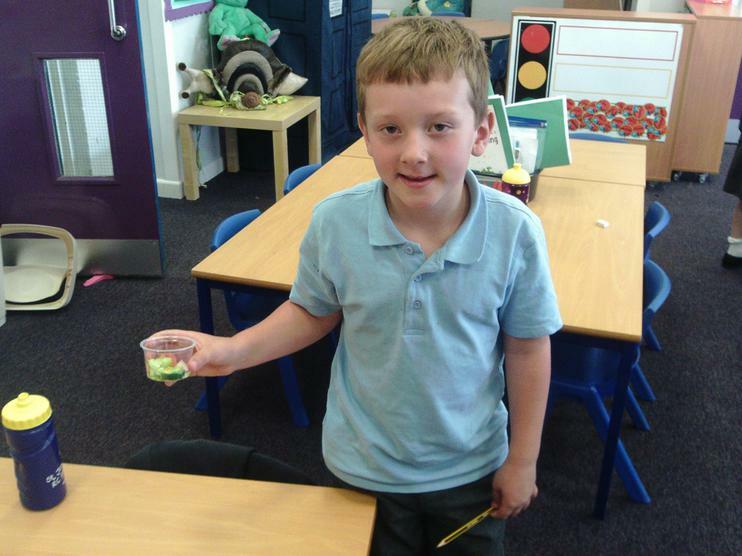 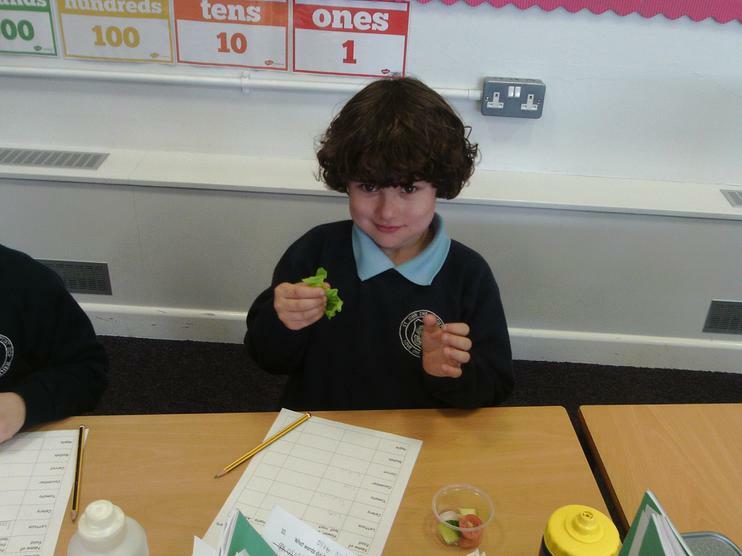 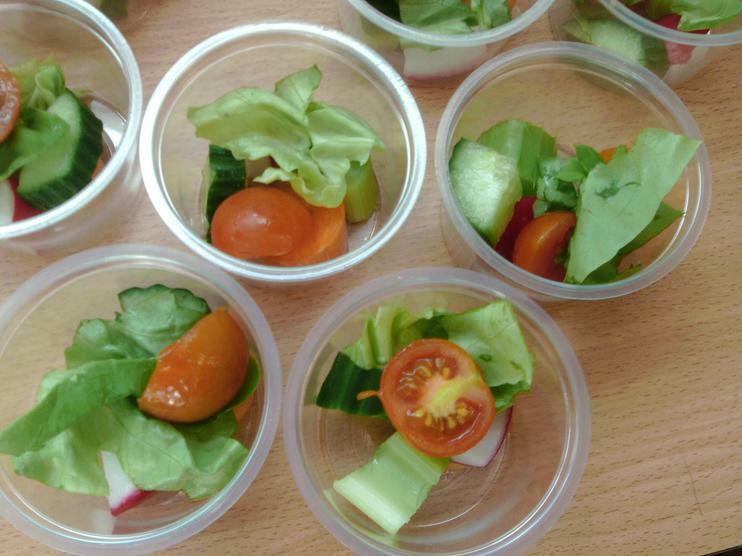 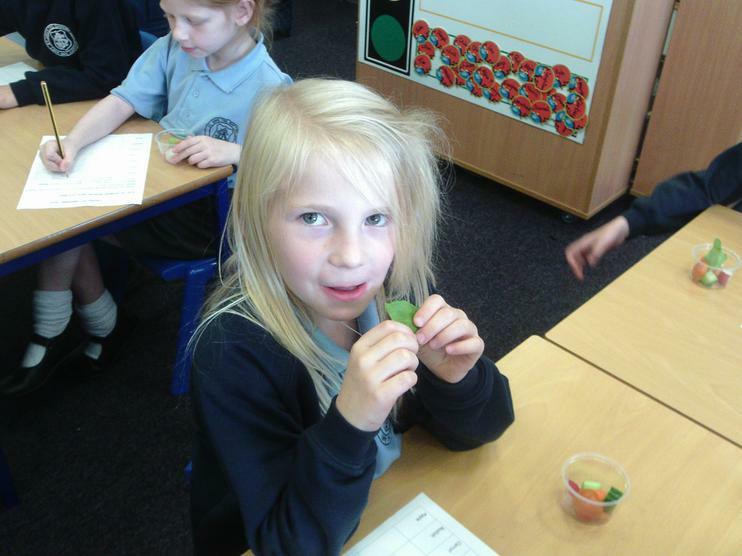 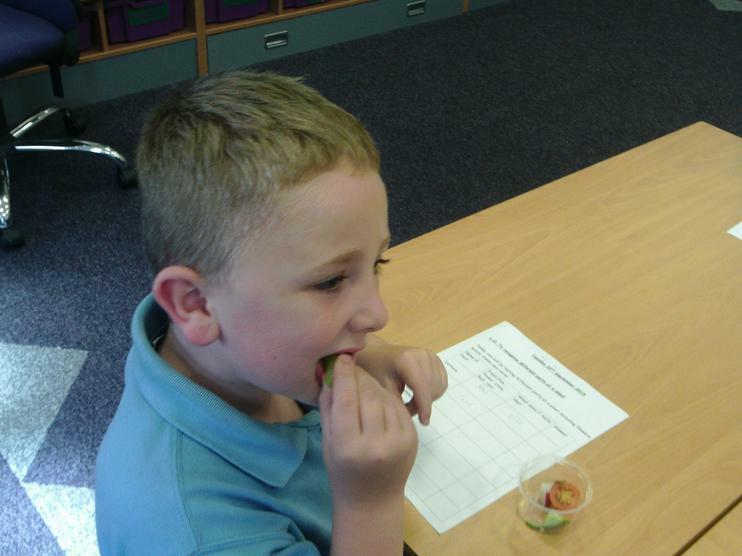 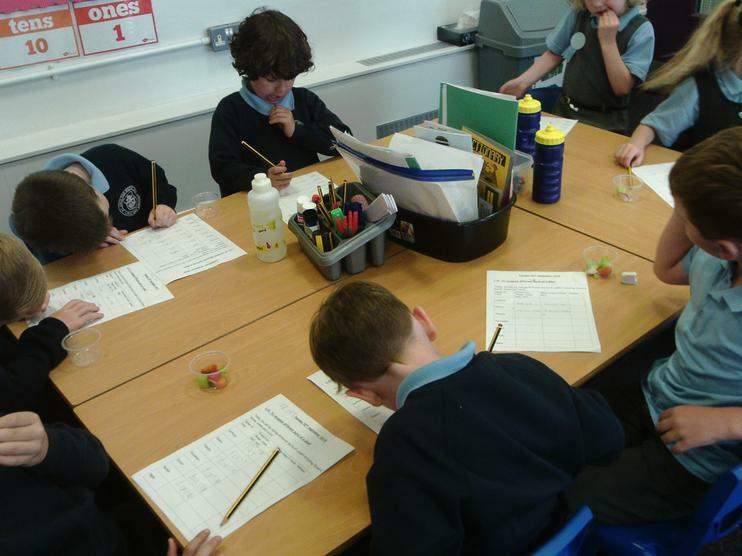 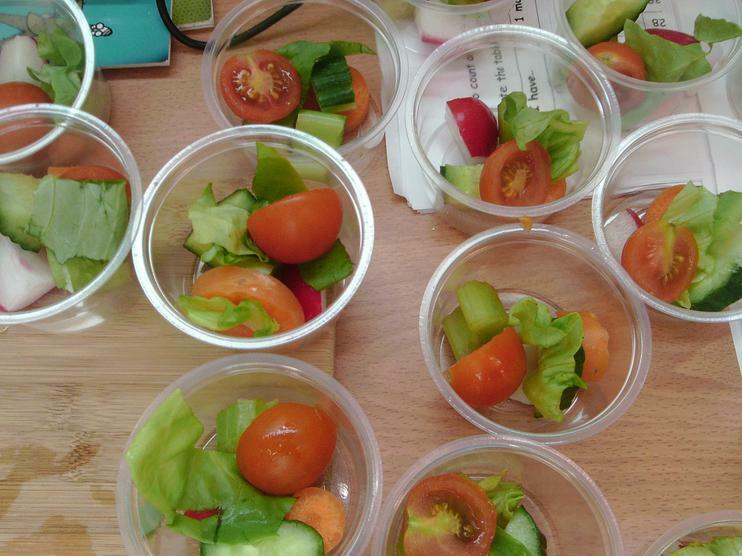 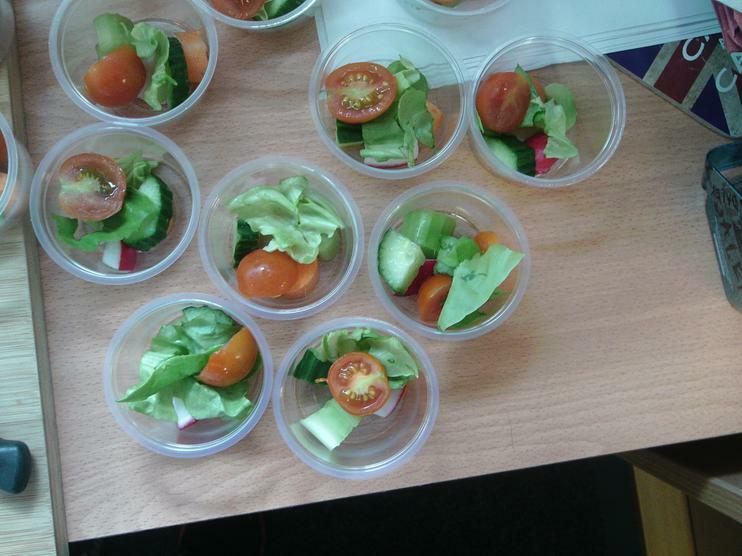 We then did a taste test and predicted whether we were eating the FLOWER, STEM, LEAF or ROOT! 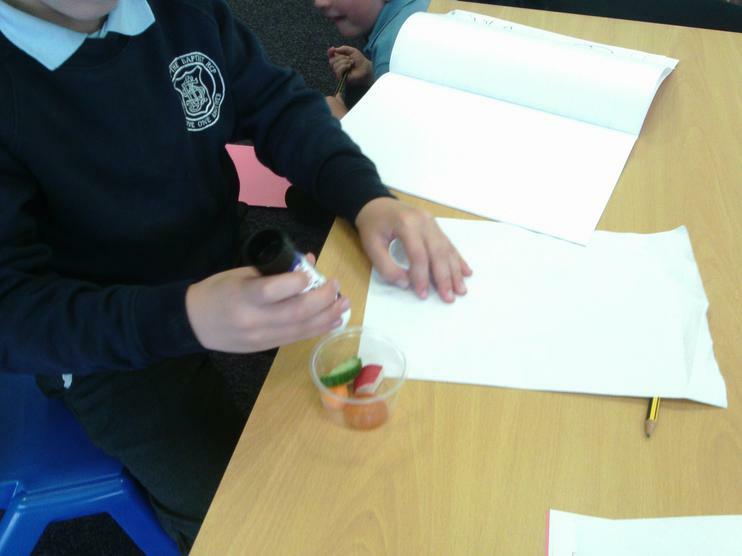 We all made really sensible predictions and couldn't quite believe what we were actually eating. 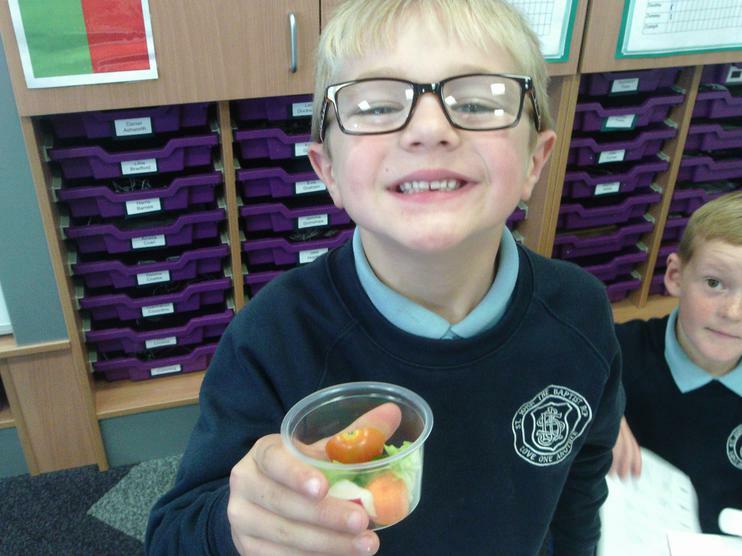 DID YOU KNOW that a carrot, radish and potato are all ROOTS? 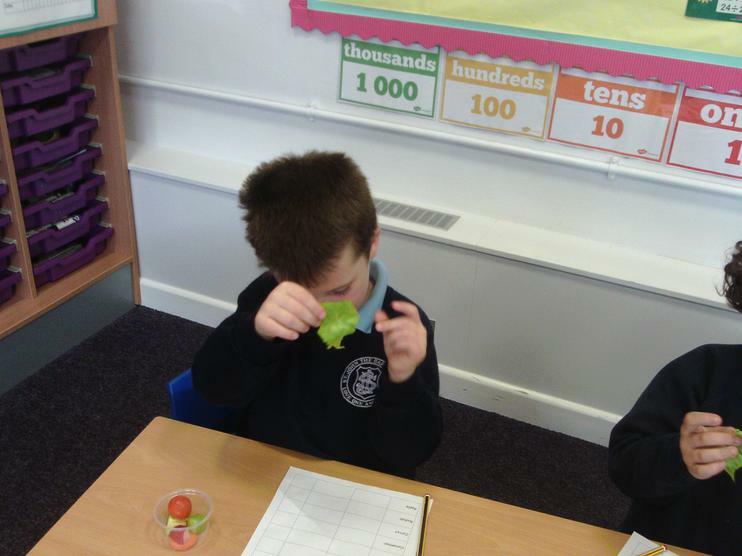 Lettuce, herbs and spinach are LEAVES! 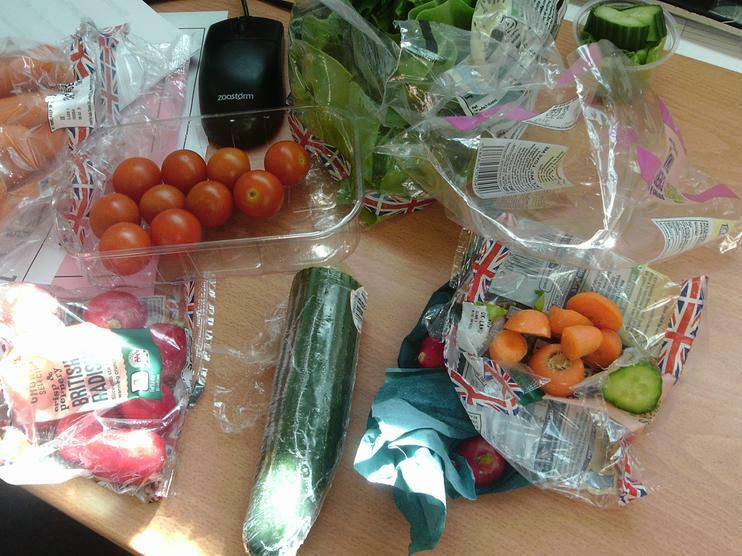 Apples, tomatoes and cucumber are all FLOWERS! 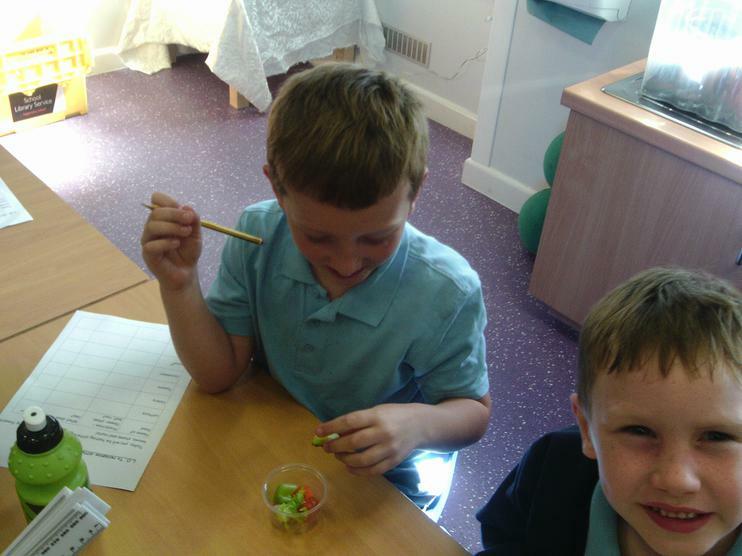 ...and celery and rhubarb are STEMS! 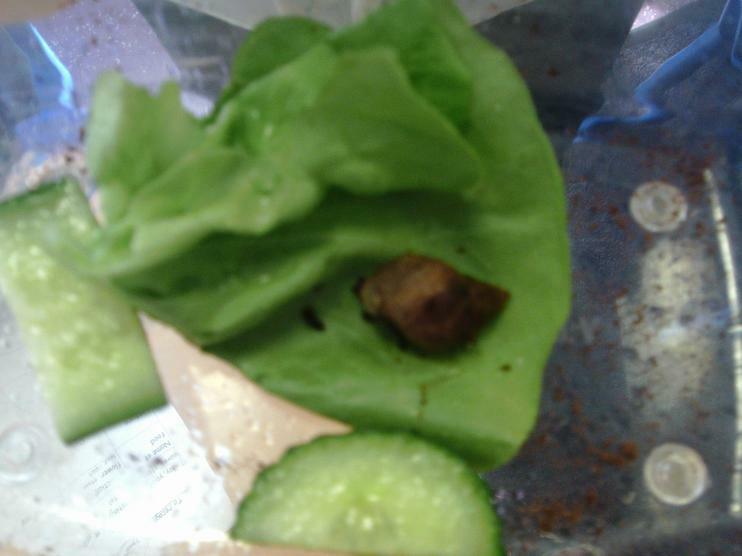 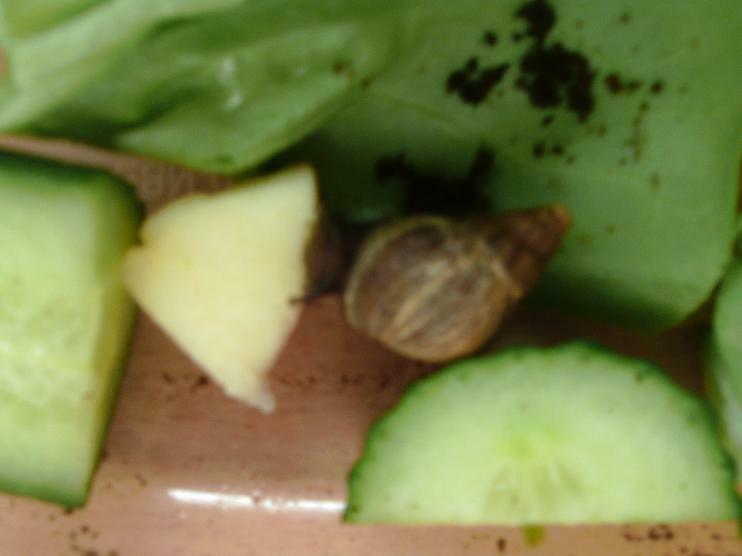 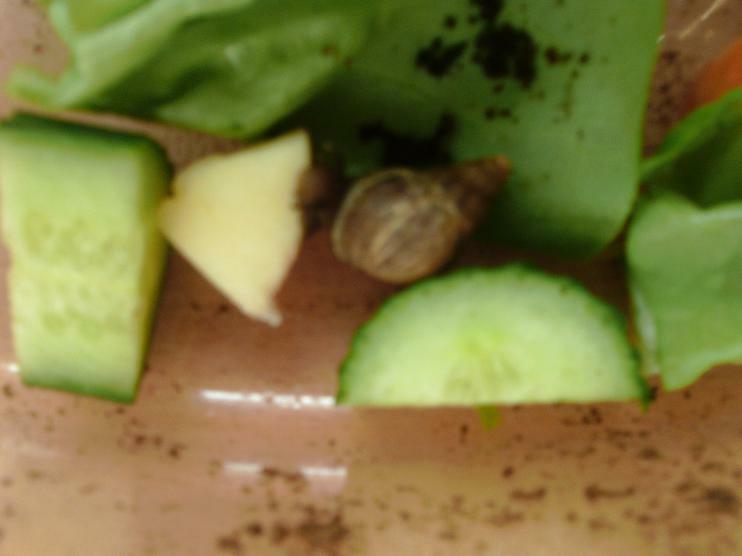 Oh yes, Stanley the snail helped us out testing the lettuce, cucumber and apple. 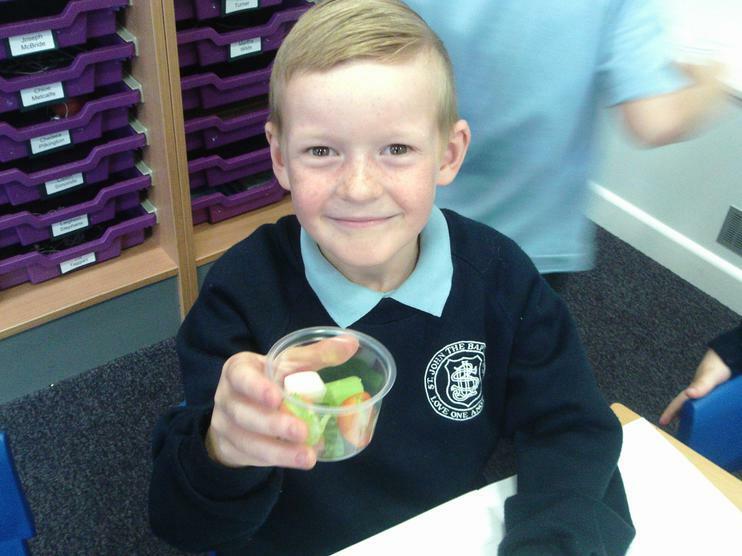 He was very pleased that everyone enjoyed the cucumber...his favourite!